Hardwood is one of the best materials for home flooring because of it’s elegance, beauty and durability. Homes with hardwood floors are often considered to have class and style that definitely create an impression of refinement and even affluence. Because of this a lot of people think that cleaning and maintaining hardwood floors is a complicated matter. A lot of New Port Richey, Florida homeowners are afraid to touch their hardwood floors, fearing that they might cause damage on these classic beauties. The opposite is actually true with hardwood floors as they are among the easiest floors to clean and maintain. While it is true that they can be more vulnerable to scratches and damages when compared to granite and marble, hardwood floors are actually very sturdy, being able to last for generations with proper care. Cleaning hardwood floors should not really be a difficult task to do if you know simple steps on caring for them. Here are some tips for cleaning, and maintaining hardwood floors in your New Port Richey, Florida home. The supplies and materials needed for cleaning are actually quite simple. The basic knowledge you should know about proper hardwood floor care is not really that complicated. 1. Maintain the hardwood floor’s cleanliness by sweeping it regularly with a broom with fine bristles. 2. Vacuum the floor at least twice every week to eliminate sand and dirt that may cause scratching. To avoid damage, use the vacuum cleaner’s soft brush nozzle. 3. Water is among your hardwood floor’s worst foes. Eliminate water and moisture as soon as you spot them. Wipe accidental spillage with soft dry cloth or chamois to dry the floor very well. 4. When mopping hardwood floors, use a dry mop dampened very lightly with clean water. If the mop is too wet, it can cause damage to the floor. 5. To prevent damage caused by footwear, put carpet runners on the hardwood-floored areas that often get high traffic. 6. Runners and rugs should be vacuumed regularly to eliminate dirt and sand that may go through the weave and may scratch the wood beneath. 7. Avoid wearing shoes with hard soles or pointy heels when walking on hardwood floors, they may cause dents and bumps. 8. By no means should you drag you furniture or heavy objects across the floor’s surface. If you need to transfer a heavy fixture from one place to another, clean the floor first of sand and dust, then place furniture pads under the piece being moved so that it can easily slide without scratching the floor. 9. Put floor mats by every entrance to clean shoes before stepping in the house. 10. Ask your floor manufacturer for their recommendations on how to treat dents and scratches on hardwood floors. Contact manufacturer if there is damage caused by water. 11. Install furniture pads underneath chairs, tables, closets, dressers and other pieces of furniture that can be moved. This way when you can easily slide them when cleaning the floor. 12. Ask your floor manufacture for their recommendations regarding the waxing or buffing requirements of the floor. Specific types of hardwood floors need specific care. 13. 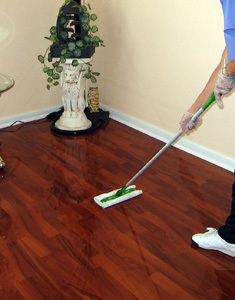 Ask the floor manufacturer about recommended cleaning agents for the hardwood floor. 14. To remove water spots, use a steel wool no. 2 and just reapply wax on the area to restore its finish. 15. To remove mild cigarette burns, rub the floor with steel wool dampened by soapy water. 16. To eliminate dark spots such as ink stains, you can rub the floor with a steel wool no. 2 moistened by a recommended floor cleaner. If the spot is stubborn, you may sand it carefully with very fine sand paper. After removing the stain, reapply wax and polish the floor. For extremely stained floor, the area might have to be replaced. 17. To remove chewing or bubble gum, apply ice to the gum deposit until it hardens and becomes brittle enough to chip off. Dry the floor immediately. If there are stains left, clean with a recommended cleaning agent. Hardwood floors in our New Port Richey, Florida home are considered to be investments, not only can they increase the real estate value of a house, they can make homes quite cozy and nice to live in. Cleaning and maintaining hardwood floors do not really have to be complicated. With these steps in mind, you can easily keep your hardwood floor to last for the generations to come.